The #@! !% Suzuki-Documentary, « Dad and the Dandelions », which first aired on March 2nd, 2017, represented the boldest anti-pesticide campaign against the golf industry by falsely and strongly implying that golf courses cause cancer. The golf industry responses to the #@! !% Suzuki-Documentary, authored by the trade associations and entitled « FAQ Document for Golf », are WORTHLESS. The trade associations have, yet again, failed their members ( owners, players, and especially golf superintendents ). Are these trade associations operated by blind idiots ?!?! As confirmed by the way they responded, the leaders of these trade association are not only idiots, they are also lazy and stupid and nearly functionally illiterate ! Moreover, they seem oblivious to the seriousness of the attack perpetrated by David Suzuki and his fanatical-operatives. Clearly, they are NOT COMPETENT to assess pest control products and the issues which threaten the golf industry. Canadian Golf Superintendents Association, Golf Canada, IPM Council of Canada, NGCOA‎ Canada, PGA of Canada, and others. Should we trust these trade associations ?!?! These trade associations COULD NOT even be bothered to respond directly and professionally to counter the false allegations made in the #@! !% Suzuki-Documentary. Moreover, their responses were badly written, poorly structured, and clearly conceived in a hurried manner, with lots of obvious cutting-and-pasting and bad punctuation. In other industries, such important responses would have been relegated to professional writers, and NOT to amateurish and illiterate administrative staff. Instead, these trade association idiots concocted generic, inept, and ineffectual responses. THIS is the absolute best and most innovative type of response they’ve got ?!?! THIS is how the trade associations will save the golf industry ?!?! Thanks to them, there is NO longer any hopeful future in the golf industry ! They have doomed the golf industry. The trade association leaders are blind idiots who are incapable of understanding the golf industry’s unavoidable train wreck ! Even worst, trade association leaders are betraying the golf superintendents and their facilities ! Seemingly, these blind idiots agree with David Suzuki and his fanatical-operatives. Future generations will ask them … WHY ?!?! Why did you not act ?!?! Why did you betray the golf industry ?!?! Why did you allow the golf industry train wreck ?!?! Why Do Golf Courses Use Pest Control Product ?!?! For example « Why Do Golf Courses Use Pest Control Product ?!?! » should be changed to « Golf Courses Use Safe & Effective Pest Control Products ! ». • Golf courses use very minimal pest control products, but they are an absolutely necessary LAST RESORT [ ?!?! ] to prevent the spread of disease [ and other invasive & damaging pests ] . FUNGICIDES ARE OFTEN THE FIRST RESORT ― In the case of late-fall pre-snow-cover applications against snow mold disease, the only solution is applying products preventively at the highest label rates. Why are the golf industry’s trade associations groveling and apologizing for the use of pest control products ?!?! If David Suzuki and his fanatical-operatives are successful, the golf industry’s products will be prohibited in defiance of the fact that they are Health-Canada-approved, federally-legal, practically-non-toxic, scientifically-safe, and will cause NO harm. THE GOLF INDUSTRY’S TRADE ASSOCIATIONS MUST … DEMANDING THE RESCINDING OF ALL PROHIBITIONS pertaining to the use of pest control product in the urban landscape in all provincial, state, and municipal jurisdictions. THE GOLF INDUSTRY’S TRADE ASSOCIATIONS MUST ALSO … VIGOROUSLY EMBARK ON A MASSIVE PUBLIC RELATIONS CAMPAIGN declaring that pesticide-free maintenance is a DISMAL FAILURE. They must STOP validating the anti-pesticide agenda once and for all ! • Pest control product are EXPENSIVE and golf courses MINIMIZE their use to save money. • Golf course superintendents, their assistants and their staff, are ENVIRONMENTAL STEWARDS OF THE LAND and are well educated in turfgrass management, conservation, best management practices, [ and the safe & effective use of pest control products ] . • Turfgrass professionals who apply pest control product have been through a STRINGENT LICENSING PROCESS Ministry of Environment. WE ARE NOW LIVING IN THE 9|11 ERA OF GOLF-HATING AND ANTI-PESTICIDE TERRORISM … The golf industry is on a collision course with the looming shipwreck of golf-hating and anti-pesticide terrorism perpetrated by David Suzuki and his fanatical-operatives ! Suzuki hates and despises the golf industry, and demands a revocation of its pesticide ban exception status, whether golf superintendents are LICENSED or not. Suzuki does not care that superintendents are ENVIRONMENTAL STEWARDS OF THE LAND, since he conspires to destroy their golf facilities, their assets, their customers, their homes, their lifestyles, their job security, their families, their children, their loved-ones, and their futures. THE GOLF INDUSTRY IS IN LOTS OF DEEP #@! !% TROUBLE ! • Pest control product on golf courses are applied using Integrated Pest Management ( IPM ) principles. IPM DOES NOT WORK ! ― Everyone in the golf industry knows this fact. Moreover, IPM CANNOT be expected to reduce pesticide use. See segment below. THE CRITICAL ISSUES THAT MUST BE ADDRESSED BY THE GOLF INDUSTRY ― NOW ! ― INTEGRATED PEST MANAGEMENT ( IPM ) ― The golf industry must cease focusing on the ineffective practices of Integrated Pest Management ( IPM ) as the solution to environmental concerns or public affairs problems. Trade associations falsely allege that the best way to minimize inputs is through the use of Integrated Pest Management ( IPM ) are WRONG ! Overall, IPM-cultural-practices DO NOT control pests of established turf and ornamentals. The golf industry must vigorously embark on a massive public relations campaign to discredit IPM-cultural-practices, declaring them as DISMAL FAILURES. • IPM requires the judicious use of pest control products only when and where necessary to eliminate infestations of turfgrass diseases, weeds, or insect pests. FUNGICIDES ARE MOST EFFICIENT WHEN USED PREVENTIVELY ― Virtually all disease control products are MULTI-SITE CONTACT FUNGICIDES that work best when used preventively. The only available single-site fungicide, chlorothalonil, still requires lower rates and frequencies when used preventively. In the case of late-fall pre-snow-cover applications against snow mold disease, the only solution is applying products preventively at the highest label rates. • Golf courses are some of the FEW REMAINING URBAN NATURE RESERVES in existence. • There is over 175,000 hectares of green space managed by approximately 2,346 golf courses, including 30,000 hectares of unmanaged wildlife habitat under golf course stewardship. THE PLANET’S GREAT CONSERVATIONISTS NEED PEST CONTROL PRODUCTS ― The use of pest control products, as well as fertilizers, to enhance golf courses is good for the environment. The golf industry can be described as the planet’s great conservationists that supply the public with what it wants ― thicker, greener, pest-free green spaces, great playing surfaces, and natural urban reserves. For generations, the golf industries has been maintaining and conserving the world’s largest ground cover vegetation, and have contributed extensively to the beautification of our green spaces, and the preservation of our environment. And yet, David Suzuki and his fanatical-operatives could not care less. • The professional turf managers who take care of golf course properties TAKE the ENVIRONMENTAL IMPACT of their operations VERY SERIOUSLY. « TAKING THE ENVIRONMENT VERY SERIOUSLY » WILL NOT SATISFY SUZUKI & HIS FANATICAL-OPERATIVES ― These golf-hating and anti-pesticide fanatics are going berserk about the use of pest control products by golf facilities. Their acts of subversive destruction have extensively damaged the professional lawn care industry in provinces like Ontario. And golf is NEXT no matter how anyone tries to placate them. Are Pest Control Products Dangerous To Human Health ?!?! • The sale of pest control product in Canada are regulated by Health Canada and have been determined to be SAFE [ and will cause NO harm to people & to the environment ] . • Pest control product are only APPROVED AFTER RIGOROUS TESTING and a lengthy approval process managed by Health Canada. • Canada has one of the most respected and rigorous science based safety protocols for pesticide approval in the world. • Regular testing assures that products are SAFE based on applicator exposure ― products must be determined to be SAFE for individuals who work with these products on a regular basis who are at greatest risk for exposure. THE SAFETY OF PEST CONTROL PRODUCTS MUST BE BETTER EXPLAINED ― The golf industry has 6 million golfers across Canada, including 2.3 million golfers in Ontario, and, interestingly, these golfers are exposed to the VERY SAME INGREDIENTS prohibited from use by the professional lawn care maintenance. Observers have stated … if it is safe to walk and play on a pesticide-treated golf course, then why is it NOT safe to walk on a pesticide-treated lawn when the same ingredients are used ?!?! THE GOLF INDUSTRY’S TRADE ASSOCIATIONS MUST … DIVULGE TO THE PUBLIC ALL SCIENTIFIC INFORMATION that ascertains that its chemicals are definitely « minimum-risk » or « reduced-risk ». They must create a fully transparent data-base for right-to-know concerning the golf industry’s chemicals. It must demonstrate that pest control products are Health-Canada-approved, federally-legal, practically-non-toxic, and will cause NO harm. « RIGOROUS SCIENTIFIC TESTING » WILL NOT SATISFY SUZUKI & HIS FANATICAL-OPERATIVES ― They have self-designated themselves as the opposition to Health Canada and to every science-based national government regulator in the world. Overwhelming scientific evidence clearly demonstrates that pest control products are scientifically-safe, and WILL NOT cause harm to children, adults, animals, or the environment. Unfortunately, Suzuki-fanatics have shown that they are incapable of processing overwhelming scientific evidence. • The general public and golfers would have MINIMAL EXPOSURE to these products. « MINIMAL EXPOSURE » WILL NOT SATISFY SUZUKI & HIS FANATICAL-OPERATIVES ― Pest control products may briefly be found at almost undetectable levels in the environment, but they are short-lived. Furthermore, the mere ability to measure or detect the presence of a pest control ingredient in the environment is NOT an indication that it poses any risk to people or environment, especially at the trace levels at which we can now detect them, which is in parts per trillion. Furthermore, most pest control products used by the golf industry have a short half-life in the environment ― for example, 2,4-D herbicide has a relatively short half-life in water of 1 to 2 weeks. Pest control products are scientifically-safe, and WILL NOT cause harm to children, adults, animals, or the environment. And yet, David Suzuki and his fanatical-operatives could not care less about the facts. What Testing Do Golf Courses Perform To Ensure That Pest Control Product Are Safe ?!?! THE CRITICAL ISSUES THAT MUST BE ADDRESSED BY THE GOLF INDUSTRY ― NOW ! ― RIGHT-TO-KNOW DATA-BASE ― The golf industry must create a fully transparent data-base for right-to-know concerning its conventional pest control products. The golf industry itself performs NO scientific assessments of pest control products, nor is it capable of doing so. • The safety of pest control product is typically tested by independent university and government scientists who specialize in toxicology and safety of pest control products. • Because the applicators of these products experience the greatest exposure, they occasionally fund research independently to ensure the safety of the products. INDEPENDENT RESEARCH ?!?! WHAT RESEARCH ?!?! RESEARCH FROM TRADE ASSOCIATIONS ?!?! ― Should we trust the golf industry’s trade associations, which have NO ONE that has ANY expertise, training, or background in matters concerning the research pest control products ?!?! Or … should we trust the 350 educated expert independent scientists at Health Canada who evaluate all the existing evidence to determine whether pest control products meet stringent health and safety requirements ?!?! Clearly, the golf industry’s trade associations are scientifically illiterate, and are the least qualified to provide any credible advice concerning pest control products. Everyone is protected from exposure to pest control products … thanks to Health Canada … and not because of the golf industry’s trade associations. What Is The Pest Management Regulatory Agency ( PMRA ) ?!?! • Those pest control products utilized by the golf industry are each federally approved through Health Canada’s Pest Management Regulatory Agency ( PMRA ). • This agency is responsible for all regulation of these products, under the Pest Control Products Act ― they employ the very best experts specializing in toxicology and related sciences. • PMRA adheres to the most STRINGENT SCIENCE-BASED EVALUATIONS and continuously promotes [ ineffective ] sustainable pest management [ i.e. arbitrarily pesticide-free ?!?! ] that includes agriculture, parks, sports, and residential applications. HEALTH CANADA’S EXPERTISE WILL NOT SATISFY SUZUKI & HIS FANATICAL-OPERATIVES ― Suzuki-fanatics have self-designated themselves as the opposition to Health Canada and to every science-based national government regulator in the world. They are fanatically-opposed to prohibition exceptions for the golf industry. The #@! !% Suzuki-documentary, « Dad and the Dandelions », represents David Suzuki’s latest anti-pesticide campaign that falsely and strongly implies that golf courses cause cancer. Why is Suzuki doing this ?!?! David Suzuki hates golfers and despises the game of golf ― this is a fact that has been documented for over a decade. Under the false-pretext of stopping cancer, Suzuki attacks golf businesses. Do golf courses cause cancer ?!?! NO ! Is golf making people sick ?!?! NO ! Is there a cancer connection with golf’s so-called manicured perfection ?!?! NO ! How Does The Golf Course Use Of Pest Control Products Compare With The Agriculture Industry ?!?! • Pest control products for golf courses are DERIVATIVES from the agriculture industry. GOLF FACILITIES USE THE VERY SAME INGREDIENTS USED BY HOME-OWNERS, PROFESSIONAL LAWN CARE BUSINESSES, & FARMERS ― Overall, the golf industry enjoys the benefits from an exception status despite the fact that it uses the very same ingredients employed by home-owners, professional lawn care businesses, and farmers. Golf facilities use six per cent of all pest control products in provinces like Manitoba. Some observers have commented that if golf facilities account for 6 per cent of the pest control products use, and feel they deserve an exception status, it should be pointed out that a residential home lawn only accounts for 0.00000001 per cent, and therefore is far more deserving of an exception status than they are. • The same basic products are used to protect plants from disease [ and other invasive & damaging pests ] . • The agriculture industry in Canada uses approximately 94 per cent of all pest control product applied and Health Canada’s PMRA ensures that the safety of the food grown is well within the acceptable risk levels for consumption. BY CONTRAST, GOLF FACILITIES MAY BE USING UP TO SIX PER CENT OF ALL PEST CONTROL PRODUCTS ― Golf facilities use six per cent of ALL pest control products in jurisdictions like Manitoba. The golf industry currently enjoys the benefits from an exception status against anti-pesticide prohibition despite the fact that it uses the very same ingredients used by home-owners, professional lawn care businesses, and farmers. The golf industry must plan for the inevitable and total revocation of this exception. The golf industry deserves prohibition as much as the professional lawn care industry. In a despicable attempt to distract activists, government officials, and the public, several golf industry trade associations have supported prohibitions since 2008. Even more despicable, some golf industry trade associations, like Golf Canada, have financially supported anti-pesticide organizations in their conspiracies against the professional lawn care industry. In Ontario, idiotic golf industry trade associations like Canadian Golf Superintendents Association ( CGSA ) have validated the anti-pesticide agenda, leading to the annihilation of the professional lawn care industry ! CGSA and other idiotic trade associations torpedoed the professional lawn care industry. Prohibitions have led to catastrophic carnage for professional lawn care businesses, in the form of horrific fines, business destruction, and business failures. Now, federal and provincial officials are considering the imposition of prohibition against all those industries that use pest control products, including the golf industry. Apparently, these officials have not only concluded that pest control products are NOT SAFE for use on home lawns, they may soon arbitrarily conclude that these products are unsafe for use on golf courses. OVERALL, PEST CONTROL APPLICATIONS ARE SAFE ONCE THE PRODUCT HAS DRIED ― This statement still fails to address the issue of golfers licking and touching golf ball that may have been contaminated with pest control products. However, it can be stated that NO one needs to worry about people playing on pesticide-treated grass since all pest control products are federally approved, scientifically safe, practically non-toxic, and cause NO harm. In general, the amount of pest control product transferred during direct contact with treated turf surface is LOW, typically less than five per cent of the applied rate. Overall, product label directions dictate that in order to further minimize any unnecessary exposure, it is good practice to stay off treated areas until residues are dry. A few minutes after the application has dried, pest control products are NO threat. After a pest control product dries on the leaf, it is difficult, if NOT impossible, to dislodge residues off the leaf surface. At Health Canada, the level of exposure is determined by assuming that individuals are exposed to pest control product residues immediately after application. If these levels are at least one-hundred times less than the most conservative toxicity date for the pest control product ( i.e. the level at which NO effect was observed in any animal model ), then this minute level of exposure is NOT of concern, and re-entry into the treated area is permitted once the residues are dry. If not, then additional time may be required for the residual levels of the pest control product to dissipate, which may result in a re-entry interval of four, twelve, or twenty-four hours, in some cases like Compass 50 WG, Heritage MAXX, and Subdue MAXX. The responsible use of pest control products on golf courses NOT only requires knowledge on how to properly handle the product, but also good communication to ensure that workers and golfers are protected. • THERE IS NO SIGNIFICANT RISK. « NO SIGNIFICANT RISK » WILL NOT SATISFY SUZUKI & HIS FANATICAL-OPERATIVES ― Overwhelming scientific evidence clearly demonstrates that pest control products are scientifically-safe, and WILL NOT cause harm to children, adults, animals, or the environment. Suzuki and his fanatical-operatives have shown that they are incapable of processing overwhelming scientific evidence. Do you want to trust these fanatics, who conveniently ignore scientific evidence, and attempt to impose their twisted life-style choices against the golf industry ?!?! THE GOLF INDUSTRY’S TRADE ASSOCIATIONS MUST … DIVULGE TO THE PUBLIC ALL SCIENTIFIC INFORMATION that ascertains that its chemicals are definitely « minimum-risk » or « reduced-risk ». They must create a fully-transparent right-to-know data-base, demonstrating that pest control products are Health-Canada-approved, federally-legal, practically-non-toxic, and will cause NO harm. Is The Industry Attempting To Reduce The Number Of Pest Control Product Used On Golf Courses ?!?! TRADE ASSOCIATIONS ARE ATTEMPTING TO REDUCE THE NUMBER OF PEST CONTROL PRODUCTS USED ON GOLF COURSES BY PROMOTING THE DOWNGRADE OF PLAYING CONDITIONS ― Trade associations have embarked on a ludicrous and ill-fated campaign to downgrade playing conditions. This is their ultimate plan for the REDUCTION of pest control products. Associations like Canadian Golf Superintendents Association ( CGSA ) have stated … « the golf industry around the globe has embarked on an effort to reduce the expectations of the golfer ». [ ?!?! ] In other words, trade associations have embarked on a campaign of driving playing customers away by telling them what they want. Unfortunately, it is NOT the role of trade associations, like CGSA, to dictate expectations to golf facility owners and their playing customers ! Perhaps trade associations, like CGSA, favour large numbers of golf facilities that will become abandoned waste dumps. Perhaps trade associations, like CGSA, actually favour those playing conditions found in Trona, California. THE GOLF INDUSTRY DESPERATELY NEEDS CONVENTIONAL PESTICIDES ! ― Without conventional pest control products, golf facilities become pest-infested and unplayable garbage dumps. It is impossible for golf superintendents to keep their facilities playable and attractive by using inferior green alternative pesticides and ineffective sustainable practices, which CANNOT be relied upon to properly maintain golf facilities. The Canadian Golf Superintendents Association ( CGSA ), and other trade associations, must CEASE focusing on alternative methods of pest control as the solution to their public affairs problems. CGSA has wrongly-alleged that the best way to minimize inputs is through the use of Integrated Pest Management ( IPM ), despite the fact that, overall, IPM-cultural-practices CANNOT control damaging and invasive pests. THE CRITICAL ISSUES THAT MUST BE ADDRESSED BY THE GOLF INDUSTRY ― NOW ! ― PEST CONTROL PRODUCTS ― The golf industry must strongly adopt the position that conventional pest control products are scientifically-safe and will cause NO harm. The golf industry must also adopt the policy that the only course of action against David Suzuki and his fanatical-operatives is through litigation. • Much of the current research at Guelph Turfgrass Institute ( GTI ) focuses on [ inferior ] green alternative pesticides and [ ineffective ] sustainable ecological cultural practices [ ?!?! ] to aid turfgrass managers in REDUCING overall the use of pest control products [ by promoting the downgrade of playing conditions ?!?! ] . GREEN ALTERNATIVE PESTICIDES ARE INFERIOR & DO NOT WORK ! ― There are NO alternatives that work. When it comes to controlling pests, the use of safe and effective conventional pest control products should be a no-brainer. It is impossible for superintendents to protect their golf facilities by using inferior green alternative pesticides and ineffective sustainable practices. There are NO viable, NO efficacious, NO economical, and NO low-risk alternatives to replace conventional pest control products. Green alternative pesticides are BOGUS AND DISMAL FAILURES ― they DO NOT WORK and they are NOT innovative products. By definition, ALTERNATIVES ARE INFERIOR, which is why they did NOT win the market-place originally. Overall, green alternative pesticides are ineffective, inadequate, inferior, high-risk, more toxic, and stunningly expensive ! In many cases, green alternative pesticides are questionably higher in toxicity, and pose higher environmental risks. Conventional pest control products are absolutely necessary. Fortunately, conventional pest control products are safe, effective, economical, and low-risk. THE GOLF INDUSTRY’S TRADE ASSOCIATIONS MUST … STOP VALIDATING GREEN ALTERNATIVE PESTICIDES just to appease David Suzuki and his fanatical-operatives. • SUSTAINABLE GOLF COURSES [ i.e. arbitrarily pesticide-free ?!?! ] are a key focus of researchers with emphasis on REDUCING INPUTS [ by promoting the downgrade of playing conditions ?!?! ] . 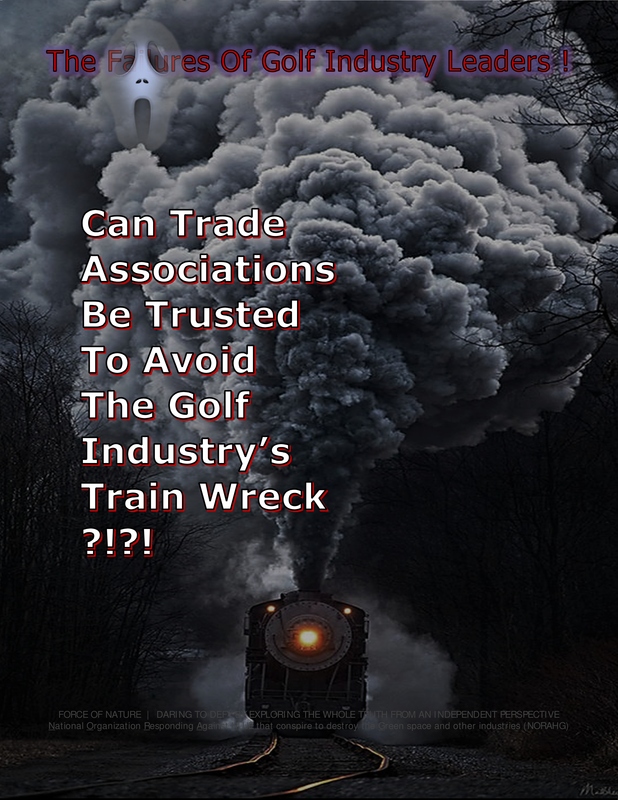 WHY ARE TRADE ASSOCIATION LEADERS ALLOWING THE GOLF INDUSTRY’S TRAIN WRECK ?!?! ― Who decided that golf courses are NOT sustainable ?!?! Why have the trade associations decided that the use of pest control products must be demonized ?!?! Whose side are they on ?!?! Clearly, the trade associations are AGAINST golf superintendents and their facilities ! Trade associations have embarked on a ludicrous and ill-fated campaign to reduce pesticide inputs ( by downgrading playing conditions ). Who gave them this mandate ?!?! Was this debate debated and voted by members at general assemblies ?!?! Why are trade associations promoting the downgrade of playing conditions ?!?! Again, who gave them this mandate ?!?! Can trade association leaders be trusted ?!?! Clearly not, since they are concocting anti-industry mandates in dark places, avoiding open debate in the light of day, and, seemingly, seeking to harm golf superintendents and their facilities ! Their support of so-called sustainable and pesticide-free mandates WILL HARM golf superintendents and their facilities. Why are they doing this ?!?! Why are trade association leaders positioning themselves WITH David Suzuki and his fanatical operative ?!?! Why have they not told Suzuki to Get OFF Our grASS and Roast In Hell ?!?! Why ?!?! Why have they chosen a path of betrayal that WILL BE LETHAL AND FINAL for golf superintendents and their facilities ?!?! THE GOLF INDUSTRY IS IN LOTS OF DEEP #@! !% TROUBLE ! Don’t The Pesticide Companies Fund All The Research ?!?! If So, Does This Funding Have Any Impact On Opinions Related To The Use Of Pest Control Products ?!?! • Health Canada requires that the data collected for safety and efficacy trials must be collected objectively from independent researchers and often university faculty whom have NO VESTED INTEREST [ ?!?! ] in the company nor the results of the research [ ?!?! ] ― this is assured by the rigour within the Health Canada review process. • Much of the research is funded by not-for-profit industry professional associations who are interested in protecting their members such as golf course superintendents, owners, sod farmers and sports field managers. UNIVERSITIES DO HAVE VESTED INTERESTS & HAVE FAILED THE GOLF INDUSTRY ― Since 2010, government officials employed by the University of Guelph have recommended illegal and exorbitant repeat applications of Fiesta Herbicide in an attempt to compensate for its DISMAL FAILURE as a weed control product. Clearly, recommendations substantially exceeding the directions for use of Fiesta Herbicide were concocted to improve the performance of a mediocre product, and to preserve the university’s VESTED INTEREST in further obtaining money to research this product. In fact, the ONLY legal recommendations for Fiesta are found within its label, and NOT with University of Guelph. Observers demanded that Health Canada launch an investigation for REPEATEDLY VIOLATING FEDERAL LAW against University of Guelph, Guelph Turfgrass Institute, Pamela Charbonneau, and Rob Witherspoon. Observers expected that those government officials found abusing their status and authority as university experts should be subject to compliance and enforcement measures, as set forth by the Pest Control Products Act and Regulations. They could not be bothered with legal and registered label directions when it was easier to LIE and CHEAT. Officials at the university also had VESTED INTERESTS in protecting the 2009 provincial prohibition imposed by THEIR EMPLOYER, the Ontario government. Consequently, these officials have betrayed everyone by falsely-validating Fiesta as a legitimate weed control. Additionally, because of the FAILURES of ALL green alternative pesticides evaluated by the University of Guelph, government officials have been reduced to recommending hand-weeding as an alternative to conventional herbicides, thereby devalorizing the professional labour force of the golf industry into a group of mere cotton-pickers. The University of Guelph WAS, at one time, the proud and reliable learning and research epicentre of the golf industry, with no vested interests ― NO LONGER ! THE CRITICAL ISSUES THAT MUST BE ADDRESSED BY THE GOLF INDUSTRY ― NOW ! ― ANTI-PESTICIDE TEACHING & RESEARCH INSTITUTIONS ― The golf industry must terminate all relationships with all teaching and research institutions, such as University of Guelph, that validate and support the prohibition against pest control products. All joint activities and educational seminars must be ended for an indefinite period of time. SOME MUNICIPAL SPORTS FIELDS ARE NO LONGER TREATED WITH PEST CONTROL PRODUCTS BECAUSE THEY HAVE BEEN CONVERTED TO ARTIFICIAL/SYNTHETIC GRASS, WHICH ARE EXORBITANTLY EXPENSIVE & DANGEROUS ! ― With anti-pesticide prohibition, it has become impossible to maintain a natural grass on areas like sports fields. Consequently, natural grass sports fields are being replaced by exorbitantly expensive and dangerous artificial/synthetic grass. The real risks of artificial/synthetic grass have been overlooked in the unscientific panic about pest control products. When it comes to pest control products, government officials can learn a lot from the experience of those who have gone before ― if the goal is to reduce real and verifiable risks, promote a more natural environment, and encourage healthy activities ― prohibiting pest control products seems a strange way to go about it when switching to artificial/synthetic grass. There are real risks when using artificial/synthetic grass. Here are examples ― • Exorbitant costs of installation • Heat effects leading to health risk since surface temperatures are much higher • Higher costs not considered for grooming, brooming, and repairs • Higher incidences of non-contact injuries • Increased abrasions that lead to infections • Potential environmental clean-up costs • Repeated disposal in landfills • Toxic chemical and toxin exposures on fields, and the risks to children • Toxic chemicals and toxins disbursed from field, such as zinc and other compounds, that can potentially run-off at levels that are above ground-water standards. Artificial/synthetic grass is exorbitantly expensive and dangerous ! • The users of sports fields would generally prefer higher quality turfgrass surfaces, and acceptable playing conditions have been shown to be achievable by restricting access, installing irrigation and using proper turfgrass management techniques such as topdressing, aeration, proper fertility, over-seeding and irrigation practices. These all come at an increased cost. Why Have Golf Courses Not Followed The Pesticide-Free Strategy ?!?! • Golf courses have NOT adopted a « NO PESTICIDE » POLICY because the requirement for acceptable playing conditions are high, and fungal disease pathogens, such as dollar spot and snow molds, would destroy the playing surface. • The only way to achieve these conditions is through the use of pest control products. Is There A Difference Between The Pest Control Product Used On Golf Courses In North America, & Those Used In Other Countries ?!?! • North America, in particular Ontario has been very progressive in reducing the amount of overall the use of pest control products on golf courses. • Many other countries, Scotland in particular, use fewer pest control product than Ontario on their golf courses. Φ Many turfgrass weeds and diseases are directly related to climate and type of turfgrass used on the golf course. • Scotland has an ideal climate for « naturalized » golf courses, consequently requiring less overall pesticide. THE MYTH OF SCOTTISH GOLF COURSES ― Scotland’s so-called naturalized golf courses are NOT typical. Scotland’s temperate climate and low number of players DO NOT represent the vast majority of golf facilities. Scotland’s atypical conditions are ideal for the maintenance of reduced-pesticide turf. Moreover, most golf courses have wear problems due to player traffic and gold cars that are far beyond their original design capabilities. Such conditions will lead to added pest problems. In comparison, North American putting greens are small and vulnerable to wears problems, whereas Scottish may be two to four times larger, and hence, are better able to tolerate player traffic. • Other countries have access to and use additional pest control products. Φ North American golf courses have recognized THE NEED TO IMPLEMENT SUSTAINABILITY into all maintenance aspects of the golf course, and PESTICIDE REDUCTION is included under this umbrella. AGAIN, TRADE ASSOCIATIONS ARE ATTEMPTING TO REDUCE THE NUMBER OF PEST CONTROL PRODUCT USED ON GOLF COURSES BY PROMOTING THE DOWNGRADE OF PLAYING CONDITIONS ― Trade associations have embarked on a ludicrous and ill-fated campaign to downgrade playing conditions. This is their ultimate plan for the REDUCTION of pest control products. In other words, trade associations have embarked on a campaign of driving playing customers away by telling them what they want. Unfortunately, it is NOT the role of trade associations to dictate expectations to golf facility owners and their playing customers ! Is It Possible For Golf Courses To Function Without Pest Control Product ?!?! PESTICIDE-FREE GOLF MAINTENANCE IS BOGUS & IMPOSSIBLE ― Golf-hating fanatics, like David Suzuki and his operatives, are falsely-alleging that pesticide-free has become a major trend in the golf industry. There are over two thousand golf courses across Canada. There are⁄were three, yes THREE, known so-called organic golf courses in Canada. Blackburn Meadows Golf Club, Brigadoon Golf Course, and Fiddler’s Green Golf Course. Two of these golf facilities are now bankrupt, closed, and⁄or gone. One facility may actually be lying about being pesticide-free. Pesticide-free golf maintenance is impossible, and can only lead to catastrophic playing conditions and business FAILURES. These types of courses often DO NOT have high-end playing conditions, which are inadequate for paying players. There will be a lot of unhappy golfers, and bankrupt golf businesses, if the golf industry goes pesticide-free. THE CRITICAL ISSUES THAT MUST BE ADDRESSED BY THE GOLF INDUSTRY ― NOW ! ― ORGANIC PESTICIDE-FREE GOLF FACILITIES ― The golf industry must establish policies for expelling superintendents and golf facilities using this inaccurate and misleading term from its trade associations. Providing players with high-quality conditions CANNOT be successful with inferior green alternative pesticides and ineffective sustainable practices. Additionally, the golf industry must vigorously embark on a massive public relations campaign to discredit organic pesticide-free maintenance practices, declaring them as DISMAL FAILURES. THE GOLF INDUSTRY DESPERATELY NEEDS CONVENTIONAL PESTICIDES ! ― Without conventional pest control products, golf facilities become pest-infested and unplayable garbage dumps. It is impossible for golf superintendents to keep their facilities playable and attractive by using inferior green alternative pesticides and ineffective sustainable practices. PESTICIDE-FREE LEADS TO CATASTROPHIC BUSINESS CARNAGE ― Pesticide-free golf courses will lead to carnage in the form of BUSINESS DESTRUCTION AND BUSINESS FAILURES. David Suzuki and his fanatical-operatives have been the principal architects in the conspiracy to prohibit against pest control products used in the urban landscape. They have already inflicted apocalypse against the professional lawn care industry, leading to owners, employees, and families dependent on safe and effective pest control products facing terror, despair, and destitution. In essence, Suzuki- fanatics conspired to destroy their businesses, their assets, their customers, their homes, their lifestyles, their job security, their families, their children, their loved-ones, and their future. David Suzuki and his fanatical-operatives have tasted victory by annihilating the professional lawn care industry across Canada, and the hated golf industry is NEXT. THE GOLF INDUSTRY’S TRADE ASSOCIATIONS MUST … SEEK DAMAGES since golf facilities will be no longer able to reproduce the business results obtained prior to prohibition, and the value of their businesses will have been destroyed. THE GOLF INDUSTRY’S TRADE ASSOCIATIONS MUST ALSO … DEMAND COMPENSATION from government since prohibition will have created loss of revenues, business failures, bankruptcy, and unemployment. Are Golf Courses, Which Cannot Be Maintained Without Pest Control Product, A Danger To The Environment ?!?! • NO ! Golf courses are NOT a danger to the environment. • Golf courses are quite the opposite, in that they represent some of the few greenspaces remaining in the urban environment. • They provide refuge for many animal and insect species, as well as act as ideal growing environments for native plant and tree species. Φ Preventing erosion and reducing run-off during storm events. Φ Carbon sequestration and oxygen production. Φ Improving air quality by trapping airborne particulate matter and pollen. Φ Providing a safe recreational surface for play. Φ Regulation of urban temperatures. What Are The Environmental Benefits Of Golf ?!?! • There is no more ENVIRONMENTALLY-FRIENDLY development of raw land than a golf course. • Roads, housing, office space, retail and other commercial development drastically disrupts the original environment. • Golf preserves green space, and even improves the environmental sustainability of raw land in many cases. « ENVIRONMENTALLY-FRIENDLY GOLF FACILITIES » WILL NOT SATISFY SUZUKI & HIS FANATICAL-OPERATIVES ― These golf-hating and anti-pesticide fanatics are going berserk about the use of pest control products by golf facilities. Their acts of subversive destruction have extensively damaged the professional lawn care industry in provinces like Ontario. And golf is NEXT no matter what anyone says to placate them. Is It True That Many Golf Courses Are Certified Audubon Sanctuaries ?!?! • These courses demonstrate an even higher standard of environmental value that enhances habitat for wildlife and plants, water conservation, limiting invasive species and adding nature to the communities surrounding the property. How Does Golf Differ From Home-Owner Lawns & Parks ?!?! • Lawns and parks have historically preferred pest control products for cosmetic appeal. • For golf courses, these products are a necessity, and NOT cosmetic, due to the requirement for professional turf grasses grown in difficult climate conditions. PEST CONTROL PRODUCTS ARE NOT COSMETIC ?!?! ― Pest control products are used very selectively, and only when necessary, to protect the health of golf course turf. Primarily, they are applied to help PROTECT turf from the damage caused by insects, weeds, and diseases. Secondarily, pest control products are used for « cosmetic » reasons. They are tools that help to ensure a healthy and attractive golf course. However, Health Canada DOES NOT classify any pest control products as « cosmetic ». Trade associations must CEASE focusing on the avoidance of the term « cosmetic » as the solution to its public affairs problems. The trade associations must recognize that the golf industry is on a collision course with David Suzuki’s golf-hating and anti-pesticide terrorism, regardless of whether golf facilities apply products for « cosmetic » purposes or not ! These standards exceed the safety threshold for our own employees who have much more exposure than the public ever would. The DATA confirms that golfers themselves have NO significant risk. WHERE IS THIS DATA ?!?! ― THE CRITICAL ISSUES THAT MUST BE ADDRESSED BY THE GOLF INDUSTRY ― NOW ! ― RIGHT-TO-KNOW DATA-BASE ― The golf industry must create a fully-transparent data-base for right-to-know concerning its conventional pest control products. Golf is the #1 participation sport in Canada, responsible for more economic impact, employment, charitable fundraising, taxation, and greenspace than all other participation sports. It is important that our environmental stewardship and safety protocols be properly understood so that we may continue to provide Canada’s favorite participation sport as effectively as possible. Because of the continuous threat of imminent provincial prohibition in British Columbia, all businesses operating in the professional lawn care industry have stagnated, and, because of local municipal prohibitions, many businesses have lost over 40 per cent of their customers. This threat of prohibition was/is being maintained by David Suzuki and his fanatical-operatives, like Canadian Cancer Society and Union of British Columbia Municipalities. Beginning in 2009, when Union of British Columbia Municipalities and its member-municipalities began to recklessly and arbitrarily impose prohibition — business growth stagnated. Since 2010, businesses operating in the professional lawn care have had to reduce staffing as a direct result of municipal prohibitions. Professional lawn care businesses have had to basically put any major investment into their businesses on hold because of the continued threat of prohibition. Prohibition took away all the gains made by professional lawn care businesses in the past ten years, and made it difficult, if not impossible, to recover. David Suzuki and his fanatical-operatives have interfered in partisan politics in Quebec by strongly supporting anti-pesticide prohibition, where they believed no one in english-speaking Canada was capable of reading their french anti-pesticide campaign of mis-information. Because of anti-pesticide prohibition in Quebec, the vast majority of businesses operating in the professional lawn care industry were destroyed. Because of the 2004-2006 Quebec provincial prohibition, over 60 per cent of the businesses were annihilated, and hundreds of businesses disappeared into total oblivion. By 2011, in the sixth year after the implementation of the 2004-2006 Quebec provincial prohibition, the remaining businesses operating in the professional lawn care industry lost up to 70 per cent of the business they once had. Because of their interference in partisan politics, David Suzuki and his fanatical-operatives have created a trail of catastrophic business losses with hundreds of small businesses destroyed and thousands of people out of work. Because of anti-pesticide prohibition, Ontario now has unimaginable economic destruction with hundreds of small businesses destroyed and thousands of people out of work. Because of Ontario’s 2009 provincial prohibition, businesses operating in the professional lawn care industry lost over 500,000,000 dollars, with over 12,500 unemployed. Soon after prohibition in Ontario, one-business-per-week disappeared into total oblivion, and, over half the businesses had closed their doors by 2012. The following is using the numbers from the OTRF’s 2008 Economic Profile of the Ontario Turfgrass Industry. In Ontario if we see only two thirds of the losses experienced in HALIFAX ( A 25 PER CENT REDUCTION ) gross revenue loss would be around 315 MILLION DOLLARS, operational and wages would drop over 144 million dollars and the NUMBER OF EMPLOYEES WOULD BE REDUCED BY AT LEAST 5,250. Based on the current trends caused by the uncertainty surrounding C-64 and the banning of the of the industries’ domestic market for goods and services the reduction will exceed 80 per cent. This translates into 1-BILLION-DOLLAR IN LOSS REVENUE to the industry which will translate into A REDUCTION OF 461 MILLION DOLLARS NOT SPENT ON OPERATIONS AND EQUIPMENT due to the LOSS OF 16,800 JOBS. We understand the Liberals in Ontario are in support of this. Integrated Pest Management ( IPM ) Does Not Work ! The Golf Industry Desperately Needs Pesticides ! The golf industry DOES NOT need ineffectual IPM, but it DOES need safe and effective conventional pest control products. Without these products, golf courses become pest-infested and unplayable garbage dumps. It is impossible for golf superintendents to keep their facilities playable and attractive with Integrated Pest Management ( IPM ) involving the use of inferior green alternative pesticides and ineffective sustainable practices. IPM methods of pest control are inferior and ineffective, and CANNOT be relied upon to properly maintain golf courses. Moreover, Canadian Golf Superintendents Association ( CGSA ), and other trade associations, must cease focusing on Integrated Pest Management as the solution to its public affairs problems. CGSA has wrongly-alleged that the best way to minimize inputs ( and appease anti-pesticide fanatics like David Suzuki ) is by the industry-wide adoption of Integrated Pest Management, which is known to be ineffectual. IPM-Cultural-Practices, & « Other Methods » Cannot Be Used To Appease David Suzuki & His Fanatical-Operatives ! In 2008, trade associations like Canadian Golf Superintendents Association ( CGSA ) and Ontario Golf Superintendents Association ( OGSA ) made a serious mistake that will end badly for golf superintendents and their facilities. in order to obtain a pesticide ban exception status, these trade associations committed to reduce the use of pest control products by using Integrated Pest Management ( IPM ). Predictably, this commitment has proven impossible to keep. Because, as everyone in the golf industry knows, IPM DOES NOT WORK ! IPM cannot possibly be expected to reduce the use of conventional pest control products. The trade associations made a foolish mistake that can only be remedied, in part, by strongly opposing any threat against the golf industry’s pesticide ban exception status. This means opposing David Suzuki and his fanatical-operatives. IPM is a FAILURE and DOES NOT WORK ! Despite rigged testimonials, mock-photos, and misleading reports, Integrated Pest Management ( IPM ) is BOGUS, ineffective and DOES NOT WORK ! Sadly, IPM is promoted by those who falsely allege success, and by those who are likely concocting lies, misconceptions, and deceptions for their own nefarious vested interests. Overall, IPM is a waste of time and money for any golf course. IPM-cultural-practices DO NOT control pests of established turfgrasses, and WILL NOT ensure adequate playing conditions. IPM Is Inappropriate For The Golf Industry ! For several decades, IPM has been basterdized into a ridiculous number of versions in order to suit the needs pesticide-hating fanatics like David Suzuki, left-wing educators, and incompetent consultants. The pesticide-free-version of IPM demands the elimination of the use of conventional pest control products while adopting so-called IPM-cultural-practices. IPM is somehow expected to suppress pest populations to an acceptable level. IPM is not even the best way to simply reduce the use of pest control products. Under IPM, inferior green alternative pesticides and ineffective sustainable practices CANNOT be consistently considered as true alternatives to conventional pest control products, since damaging pests are most often only suppressed, and NOT controlled. Wherever pesticide-free-IPM is entirely relied upon for the maintenance of turf and ornamentals, damaging pests may only be slightly suppressed, at the expense of plant growth, playing conditions, and appearance. Otherwise, it is impossible for golf superintendents to keep their facilities playable and/or beautiful by using IPM. Unfortunately, IPM has been designed to be applicable to the agriculture industry, and NOT the golf industry. In agriculture, IPM is a legitimate pest management practice that uses a variety of complementary strategies, including ― mechanical devices, physical devices, as well as genetic, biological, and chemical management. IPM Provides No Benefit ! The interpretations of Integrated Pest Management ( IPM ) provide NO benefit and NO scientific basis with the use of simplistic messages like « use least toxic pesticides as a last resort » and « apply it only as a last resort ». According to three scientific organizations ― Weed Science Society of America ( WSSA ), American Phytopathological Society ( APS ), and Plant-Insect Ecosystems Section of the Entomological Society of America ( P-IE ESA ) ― these messages are NOT the correct approaches to the chemical management component of an Integrated Pest Management ( IPM ) program. IPM Does Not Excuse The Use Of Illegal Concoctions ! Golf superintendents must STOP using unregistered concoctions under the false pretext that they are following IPM-cultural-practices. Unregistered concoctions with compost tea, dish soap, vinegar, and phosphite, are NOT legal, NOT valid, NOT effective, NOT economical, and NOT safer as alternatives to legally-registered conventional pest control products. Virtually all such alternatives are BOGUS, inferior, and ineffective; and their use often violate federal law. Moreover, it is a violation of federal law to recommend or sell or use unregistered concoctions for controlling pests that are NOT registered under the federal law. If someone recommends or sells an unregistered concoction with the claim that it controls pests, it technically becomes a pest control product. Such a claim, in either verbal or written form, regarding an unregistered concoction becomes technically a violation of federal law. Additionally, preparing, storing, and using an unregistered concoction can pose risks to health and environment. Most often, an unregistered concoction is recommended by anonymous or non-expert authors who know nothing about pest control. Conventional products, such as 2,4-D and chlorothalonil, CANNOT be replaced by BOGUS, illegal, untested, unproven, and often dangerous concoctions ! IPM Is A Distraction From Science-Based Assessments ! Rather than support ineffectual IPM practices, golf superintendents would be better-off validating the risk assessment of conventional pest control products, which indicates that they are scientifically-safe, and, when used properly, WILL NOT cause harm to people, animals, or the environment. Golf superintendents MUST oppose all forms of prohibition against pest control products. IPM Is A Distraction From Critical Issues ! Golf superintendents often focus on the ineffectual IPM as the solution to their public affairs problems concerning the use of conventional pest control products. In order to successfully deter the malicious efforts of all golf-hating anti-pesticide fanatics, the golf industry must immediately address several critical issues. IPM Is A Distraction From Adequate Playing Conditions ! To compensate for the FAILURE of IPM, some golf superintendents have embarked on a ludicrous effort to reduce the expectations of their customers by promoting low-end playing and garbage dump conditions. Unfortunately, it is NOT the role of these golf superintendents to dictate expectations to golf facility owners and their playing customers ! Golf superintendents must cease focusing on the ineffective IPM as the solution to their public affairs problems. They also must cease alleging that the best way to reduce the use of pest control products is through the use of Integrated Pest Management ( IPM ), despite the fact that, overall, IPM-cultural-practices DO NOT control pests of established turfgrasses, and WILL NOT ensure adequate playing conditions. IPM Must Be Discredited ! Golf superintendents must CEASE focusing on the ineffective practices of Integrated Pest Management ( IPM ) as the solution to environmental concerns or public affairs problems. Trade associations falsely allege that the best way to minimize inputs is through the use of Integrated Pest Management ( IPM ), and they are WRONG ! Overall, IPM-cultural-practices DO NOT control pests that invade and destroy golf course turf. The golf industry must VIGOROUSLY EMBARK on a massive public relations campaign to discredit IPM-cultural-practices, declaring them as DISMAL FAILURES. The Critical Issues That Must Be Addressed By Trade Associations ― NOW ! David Suzuki and his fanatical-operatives have, since the mid-2000s, set their sights on the ANNIHILATION of the golf industry ― Canadian Cancer Society ( CCS ) • Canadian Association of Physicians for the Environment ( CAPE ) • Canadian Coalition for Health and Environment ( CCHE ) • Canadian Environmental Law Association ( CELA ) • Coalition for Alternatives to Pesticides – Newfoundland & Labrador ( CAP-NL ) • David Suzuki Foundation • Ecojustice Canada • Equiterre ( Quebec Shield for David Suzuki Foundation ) • Green Party of Ontario • Liberal Party of Canada ( LPC ) • New Democratic Party of Canada ( NDP ) • New Democratic Party of Ontario ( NDP ) • Pesticide Free BC ( British Columbia Shield for Canadian Cancer Society ) • Pesticide Free Ontario ( PFO ) • Registered Nurses’ Association of Ontario ( RNAO ) • Sierra Club of Canada. To avoid its imminent demise, and the total loss of all of its conventional pest control products, trade associations must immediately address several critical issues. Trade associations must recognize that the golf industry is on a collision course with the looming shipwreck of golf-hating and anti-pesticide terrorism ! Regardless of its provincial pesticide ban exception statuses, the golf industry faces some huge challenges because of its high degree of vulnerability concerning several public affairs issues. WHATEVER THE COST MAY BE ! 1. PEST CONTROL PRODUCTS ― Trade associations must STRONGLY ADOPT THE POSITION that conventional pest control products are scientifically-safe and will cause NO harm. Trade associations must also ADOPT the policy that the ONLY course of action against prohibition is through litigation. 2. PESTICIDE EXCEPTION STATUS ― Trade associations must PLAN for the inevitable and total revocation of golf industry’s pesticide ban exception statuses in most jurisdictions across Canada. 3. TRADE ASSOCIATIONS ― The golf industry’s trade associations MUST CEASE publicly supporting the PROHIBITION against conventional pest control products used in the urban landscape. They must also STOP conspiring to impose a doctrine of arbitrary and unnecessary fertilizer nutrient reduction. These trade associations must STOP torpedoing the professional lawn care industry. 4. FERTILIZERS ― Trade associations must also ADOPT the position that its use of any fertilizers DOES NOT harm the environment. 6. ANTI-GOLF/ANTI-PESTICIDE ORGANIZATIONS ― Trade associations must TERMINATE all relationships with David Suzuki and all of his fanatical-operatives, like Canadian Cancer Society, ( a.k.a. Prevent Cancer Now ), World Wildlife Fund ( a.k.a. Liberal Party of Canada ), and others. As long as Golf Canada, and the entire golf industry, continue to provide money to Canadian Cancer Society, the golf industry IS UNDER THREAT OF BEING ANNIHILATED ! 7. RIGHT-TO-KNOW DATA-BASE ― Trade associations must CREATE a fully transparent data-base for right-to-know concerning its conventional pest control products. 8. INTEGRATED PEST MANAGEMENT ( IPM ) ― Trade associations must CEASE focusing on the ineffective practices of Integrated Pest Management ( IPM ) as the solution to environmental concerns or public affairs problems. Trade associations falsely allege that the best way to minimize inputs is through the use of Integrated Pest Management ( IPM ), and they are WRONG ! Overall, IPM-cultural-practices DO NOT control pests of established turf and ornamentals. Trade associations must VIGOROUSLY EMBARK on a massive public relations campaign to discredit IPM-cultural-practices, declaring them as DISMAL FAILUREs. 9. ORGANIC PESTICIDE-FREE GOLF FACILITIES ― Trade associations must ESTABLISH policies for expelling superintendents and golf facilities using this inaccurate and misleading term from its trade associations. Providing players with high-quality conditions CANNOT be successful with inferior green alternative pesticides and ineffective sustainable practices. Additionally, trade associations must VIGOROUSLY EMBARK on a massive public relations campaign to discredit organic pesticide-free maintenance practices, declaring them as DISMAL FAILURES. 10. GREEN ALTERNATIVE PESTICIDES ― Trade associations must DENOUNCE the so-called green alternatives as BOGUS products. Green alternatives like hydrogen peroxide and compost tea DO NOT WORK, and may even be DANGEROUS and ILLEGAL. 11. ALTERNATIVE PRACTICES ― Trade associations must also DENOUNCE ineffective sustainable practices as so-called « legitimate alternatives » to the use of conventional pest control products. Sustainable practices DO NOT work in controlling invasive and destructive pests. 12. MAINTENANCE PROTOCOLS ― Trade associations must DEVELOP and publish golf maintenance protocols and performance standards expected by its playing customers. These protocols and standards MUST include the regular use of conventional pest control products and fertilizers, based upon REAL scientific research. 13. GO BROWN ― BROWN IS BEAUTIFUL ?!?! ― Trade associations must OPPOSE go brown anti-cosmetic golf course maintenance. Golfers DO NOT want to play on brown depressing unplayable courses. 14. POLITICAL ACTION ― Trade associations must openly and financially SUPPORT all Conservative political candidates who oppose any prohibition of pest control products and fertilizers. Whenever successfully elected to power, Liberals and New Democrats WILL ALWAYS CONSPIRE TO IMPOSE ARBITRARY PROHIBITION against ALL pest control products. 15. ANTI-PESTICIDE TEACHING & RESEARCH INSTITUTIONS ― Trade associations must TERMINATE all relationships with all teaching and research institutions, such as University of Guelph, that validate and support the PROHIBITION against pest control products. ALL joint activities and educational seminars MUST BE ENDED for an indefinite period of time. 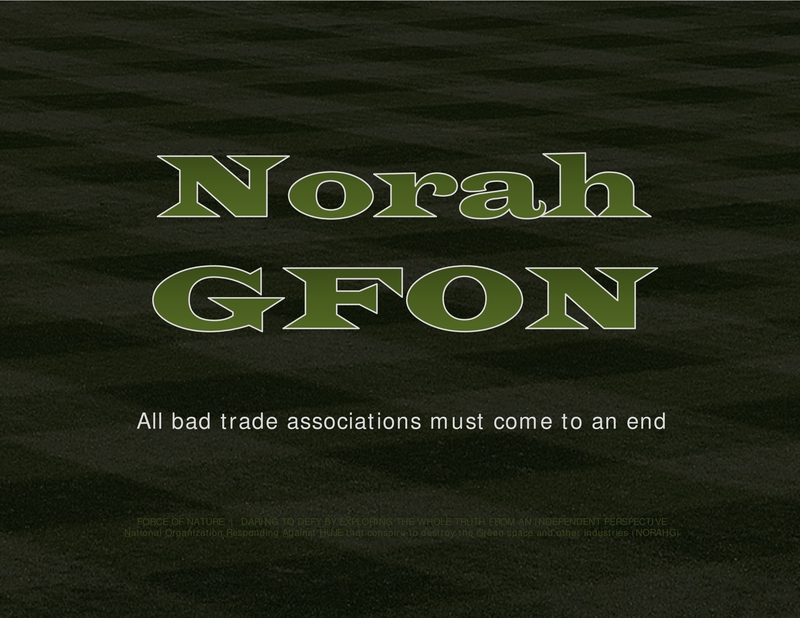 WE SPEAK THE WHOLE TRUTH ABOUT TRADE ASSOCIATIONS, FROM AN INDEPENDENT PERSPECTIVE ! Enviro-fanatics have shown that they are incapable of processing overwhelming scientific evidence. Do you want to trust these fanatics, who conveniently ignore scientific evidence, and attempt to impose their twisted life-style choices against our society ?!? !